This is the perfect beginner FPV drone, which is designed for indoor flying in even the smallest of places. Its integrated video transmitter, FPV camera, high performance motors and large 200mAh battery make this one of the most impressive and smallest drones on the market. 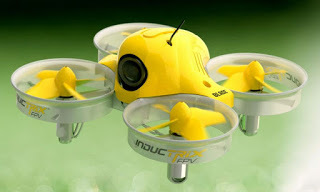 The ducted propeller design allows the drone to bounce of walls and objects without crashing.